First I demonstrated a pattern and then New Kid repeated the pattern underneath. 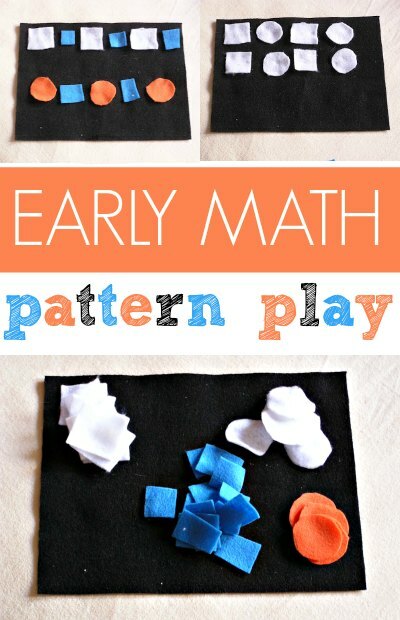 You can also start a pattern and have the child simply continue it. Once your child gets the hang of it, he can make his own patterns, or simply play around with the shapes in whatever manner he chooses. In addition to teaching pre-math lessons, preschoolers work on their fine motor skills. Win-win. Montessori triangles. You can make them yourself and they are much cheaper! Make your own puzzles. Some great ideas for toddlers and preschoolers. Felt is fantastic for activities like this! Love this! Felt is so much fun and patterns are so important! I would love if you'd share at my Teaching Time Party.